OpsCenter is a Web application for monitoring and administering all nodes in a DataStax Enterprise cluster from one centralized console. OpsCenter runs on the client-side in a web browser. Monitor performance metrics in the OpsCenter Dashboard. Real-time and historical performance metrics are available at different granularities: cluster-wide, per node, per table (column family), or storage tier. 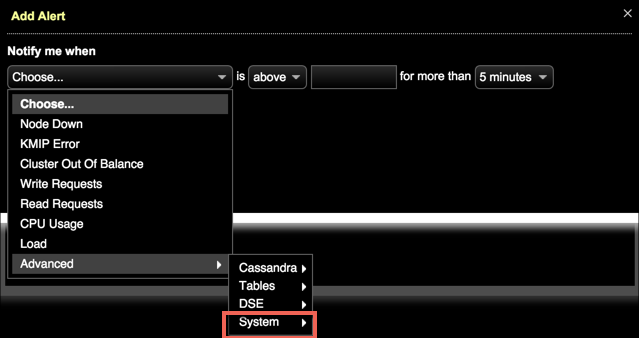 Configure alert thresholds for Cassandra cluster-wide, table, and operating system metrics in the Alerts area of OpsCenter. This proactive monitoring feature is available for DataStax Enterprise clusters. Configure advanced system metrics for memory, CPU, and disk metrics on Linux or Mac OS X. Introduces the major areas of functionality available in the OpsCenter workspace. Configure alerts to be notified when issues arise with various aspects of OpsCenter. View and monitor memory usage, node details, and the Spark Console. Use OpsCenter to perform maintenance on your nodes, clean up extraneous data, and complete repairs. Start, stop, and restart DSE on nodes in your cluster using OpsCenter. Manage keyspaces and the tables within keyspaces using the OpsCenter UI. OpsCenter manages multiple DataStax Enterprise clusters with a single install of the central opscenterd server. Administer your clusters using the options available from the Cluster Actions menu. Generate reports from the Help menu. View performance metrics in graph views from the dashboard. Clone, rename, or delete graph metric presets. Export and import presets into other clusters or OpsCenter instances. Cluster metrics monitor cluster performance at a high level. Cluster metrics are aggregated across all nodes in the cluster. OpsCenter tracks a number of cluster-wide metrics for read performance, write performance, memory, and capacity. Pending task metrics track requests that have been received by a node but are waiting to be processed. An accumulation of pending tasks on a node can indicate a potential bottleneck in performance and should be investigated. Table (formerly column family) metrics allow drilling down and locating specific areas of application workloads that are the source of performance issues. If you notice a performance trend at the OS or cluster level, viewing table metrics can provide a more granular level of detail. Storage tier metrics allow drilling down into specific storage tiers for a table to monitor the data distribution. Monitor messaging latency by adding dashboard graph metrics and alerts at the datacenter or node level. Metrics for monitoring DSE Search performance. Metrics for monitoring DSE Graph with dashboard graphs and alerts in OpsCenter. Reference of NodeSync metrics available for dashboard graphs and alerts in OpsCenter monitoring. Thread Pool metrics reference for OpsCenter Monitoring. Reference of Dropped Messages metrics available for dashboard graphs and alerts in OpsCenter monitoring. Dropped messages can indicate system stress that could impact node health. Tracking operating system metrics on Cassandra nodes to watch for disk I/O, network, memory and CPU utilization trends helps identify and troubleshoot hardware-related performance problems. Partition names must be identical when configuring a disk usage alert for multiple nodes. Comprehensive reference of performance metrics available in OpsCenter. Configure advanced system metrics for memory, CPU, and disk metrics on Linux or Mac OS X. As with any database system, Cassandra performance greatly depends on underlying systems on which it is running. Before configuring advanced system metric alerts, you should first have an understanding of the baseline performance of your hardware and the averages of these system metrics when the system is handling a typical workload. To access Advanced System metrics, choose Advanced > System in the Add Alert dialog. Memory free System memory that is not being used. Memory used System memory used by application processes. Memory buffered System memory used for caching file system metadata and tracking in-flight pages. Memory shared System memory that is accessible to CPUs. Memory cached System memory used by the OS disk cache. Idle Percentage of time the CPU is idle. Iowait Percentage of time the CPU is idle and there is a pending disk I/O request. Nice Percentage of time spent processing prioritized tasks. Niced tasks are also counted in system and user time. Steal Percentage of time a virtual CPU waits for a real CPU while the hypervisor services another virtual processor. System Percentage of time allocated to system processes. User Percentage of time allocated to user processes. Disk usage Percentage of disk space Cassandra uses at a given time. Free disk space Available disk space in GB. Used disk space Used disk space in GB. Disk read throughput Average disk throughput for read operations in megabytes per second. Exceptionally high disk throughput values may indicate I/O contention. Disk write throughput Average disk throughput for write operations in megabytes per second. Disk read rate Averaged disk speed for read operations. Disk write rate Averaged disk speed for write operations. Disk latency Average time consumed by disk seeks in milliseconds. Disk request size Average size in sectors of requests issued to the disk. Disk queue size Average number of requests queued due to disk latency. Disk utilization Percentage of CPU time consumed by disk I/O. Free memory System memory that is not being used. Used memory System memory that is being used by application processes. Free space Available disk space in GB. Disk throughput Average disk throughput for read/write operations in megabytes per second. Exceptionally high disk throughput values may indicate I/O contention.